I remember my seventh birthday fondly, I awoke and the sun was shining. Okay, I’m not exactly sure if the sun what shining but my memory of the beginning of that day is filled with sunshine. It started out with a mini celebration for my birthday; my first gift a baseball jersey shirt with pale yellow long sleeves and a foil iron-on of a unicorn with rainbows. The back was emblazoned with “I’m seven!” I know I was so excited to share with the world this awesome shirt along with the fact I was one year older. My second gift a fluffy white unicorn that turned her head along with melody from the windup music box inside her tummy. I don’t know what it is about unicorns but I have loved them since I was a little girl. I used to draw them, read about them and one of my favorite movies still is The Last Unicorn. 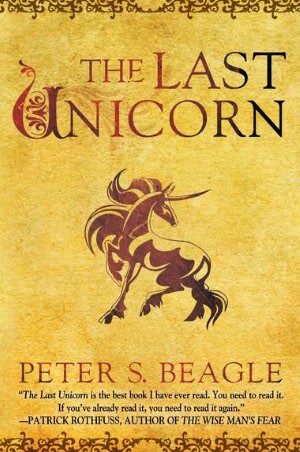 I was going to watch the movie again but then stumbled upon the book at the bookstore, it’s a 40th edition re-release of the original tale written by Peter S Beagle. When I started writing I was introduced to a book titled The Artist’s Way by Julia Cameron. It is a 12-week self led writing workshop, it dealt with removing blocks one has in place with a recurring theme that the block is fear; fear of failure, or worse, fear of success. As odd as that sounds, many fear success as how would it change ones life, how would people react…or how would I react? The main process Julia uses to help one move around the fear, and sometimes plow right through it, is to return to ones inner child. Children don’t worry innately as that is learned behavior from us adults. By returning to play one allows the creative expression without the role of inner critic squelching it before the expression takes roots. Along with returning to childhood, I was to write three pages every morning of streaming consciousness, just write and keep my hand moving; I was to have an artist’s date-pick a day for about an hours timeframe where I would just do something frivolous and fun; and peppered in each week were other tasks. One week I was instructed to create a image board to help me, a writers nook with encouraging décor urging me to just let my imagination soar with one particular task being finding a totem; something small that I could carry with me and remind me of this dream I’m wanting to feed before the fear sets in or has me in his grasp. I found a petite unicorn with pale pink glitter hair, a floral like design on her right flank and a gold horn. Now, in having a little girl she often pilfers this and I find it in her tiny purse, in her tree tent or her bed. It’s okay, as I then bring it back to my writing spot when I find it and if she takes my little totem on an expedition again, all the more fun in me finding her. Mars brings a smile to my face as I remember my link with unicorns, my love of them since childhood. After finishing The Artists Way, I then moved onto The Vein of Gold and got stuck as the first portion was “The Kingdom of Story” and I was to write a narrative timeline from my earliest memory to now. Nothing too in depth, but the highlights including the sights, sounds, feelings, and impressions I had of my self while growing up and becoming this person who is typing these words now. I started enthusiastically only to lose steam as I approached the age right after 7, yes age 8 was not a fond one nor was it filled with sunshine and rainbows. We moved from Kalispell, Montana to Helena, Montana, I started public school and found that the gilded bubble I lived in until age seven burst the moment I set foot in public school. It seems I was one who attracted being bullied. I never called it that before, only more recently do I realize what I went through while younger. Back then I thought something was wrong with me, something about me causing others to treat me this way. While I made friends, the teasing and bullying didn’t stop until High School. But the main crack in self occurred around age eight, so I walled it off; walled that 8 year old girl off to survive and continue in this world we live in. We cannot see our wholeness because while growing up, when another slung an arrow or said a hurtful comment, we believed it, we said yes “this is true” and that agreement needs to be broken. Ah childhood, as the glass half full type I do remember it fondly, but it still stopped me in my writing tracks in trying to delve into myself and find that part of me I lost so long ago, that part of myself needed to feel whole. Our experiences give us the material that we process and end up writing about or seeking out in other’s writing and sharing. To find others and feel as if not alone. “You are looking outside and that is what you should most not do right now. No one can advise or help you-no one. There is only one thing you should do. Go into yourself. Find out the reason that commands you to write; see whether it has spread its roots into the very depths of your heart; confess to yourself whether you would have to die if you were forbidden to write. This most of all, ask yourself in the most silent hour of your night, must I write? Dig into yourself for a deep answer. Write about what your everyday life has to offer (or offers to you). Describe your sorrows, and desires, the thoughts that pass through your mind and your belief in some kind of beauty-describe all these with heart felt silent humble sincerity and when you express yourself use the things around you, the images from your dreams, and the objects that you remember. For the creator there is no poverty and no poor indifferent place. And if you found yourself in some prison and wouldn’t you still have your childhood, that jewel beyond all price, that treasure house of memories? Turn your attention to it. Yes, that treasure chest of a childhood has as many gems as it has sharp edged rocks that have always been there, a nuisance more than anything and even though one thinks one can wall it off, it doesn’t really work that way. At some point, it needs to be addressed.